Avon Stephens is charged with arson in the seven-alarm fire that destroyed more than 100 luxury cars. A 23-year-old Brooklyn man was arrested in connection with a seven-alarm fire that damaged more than 100 luxury cars in the parking garage of the Kings Plaza Shopping Center in Brooklyn on Monday. Avon Stephens was charged Monday night with arson for the blaze, which first broke out just before 8:30 a.m. as multiple vehicles caught fire. It grew to a seven-alarm fire by about 11 a.m. and was finally brought under control at about 11:40 a.m. The blaze started on the second floor of the four-story garage, but quickly spread to another floor, eventually damaging more than 100 Mercedes-Benz cars, according to the FDNY and a police source. Stephens was charged in federal court for allegedly affecting interstate commerce, a second law enforcement source said. Investigators believe Stephens may have been sleeping in the parking lot but was kicked out, the police source said. 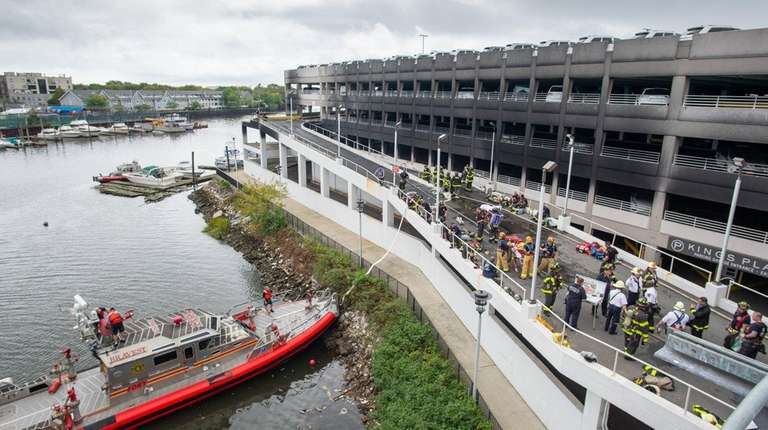 FDNY Commissioner Daniel Nigro said a local car dealer was storing cars at the garage — possibly as many as 120. It was unclear exactly how many were burned. Nigro told reporters at the scene that a total of 21 people, including 18 firefighters, suffered non life-threatening injuries, mostly including smoke inhalation and heat exhaustion. The seven alarms brought more than 50 units and 200 members to fight the blaze. It wasn’t immediately clear what sparked the flames and the fire was still under investigation.